Mellow Mushroom Serves Up a Hot Special! Mellow Mushroom 40th anniversary specials. Get it while it’s hot! Today, Aug. 20, Mellow Mushroom is celebrating their 40th anniversary and they want you to join their pizza party. 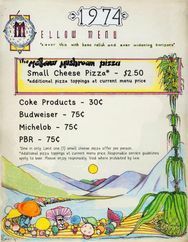 Mellow Mushroom opened in 1974, and they’ve reverted back to their old 70s pre-inflation pricing. A small cheese pizza is only $2.50 (regular prices apply for additional toppings). All fountain Cokes and sodas are $0.30, and beers including Budweiser, Michelob or Pabst Blue Ribbon, are only $0.75 cents. Check out Yelp or Google to find the Mellow Mushroom near you!